Bulgarian Journal of Agricultural Science (BJAS) is a peer-reviewed, open access, online and print journal, issued bimonthly. It has been published in English since 1995. It publishes original research papers, review articles and brief communications from all areas of agricultural science including agricultural economics, agroecology, agrochemisty and soil science, crop science, plant protection, animal science, veterinary medicine, fisheries and aquaculture, agricultural engineering, food technologies and other related areas. 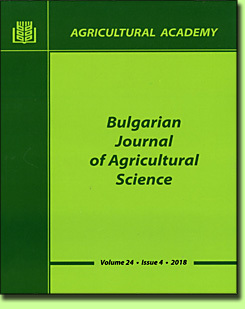 Bulgarian Journal of Agricultural Science publishes original articles, reviews and short communications that contain original experimental data or new interpretations of existing results. They must comply with the journal topics and have not been published elsewhere. The manuscript, written in English, should be submitted online after registration. Original articles should contain title, authors, abstract, keywords, list of abbreviations, introduction, materials and methods, results and discussion, conclusions, acknowledgements (if there are any), references. Text should be in Times New Roman font, in MS Office Word format. The measuring units (cm, m, km, t, l, g, kg, s, h, etc.) should be denoted according to the SI system. Latin names of plant and animal species should be given according to the International Classification, in Italic. Title. Title of the paper should be brief, accurately identifying the manuscript content, without any abbreviations. Authors. The forename and surname of each author are to be stated below the title. The institutional affiliations of authors are to be written below the names. If the coauthors are not all at the same institution or department, numbers in suffix should be used to refer the affiliations (1, 2). The name and e-mail of corresponding author should be mentioned, marked with asterisk (*). Abstract and keywords. Abstract reflects shortly and clearly the basic information and scientific impact of the article, with cited the main results obtained. Keywords must be properly selected, giving the essence of the study. Abbreviations. Abbreviations may be used for other expressions provided that, when first mentioned, they are defined in full, followed by the abbreviation in parenthesis and used consistently thereafter. Inroduction. Introduction must answer the following questions: What is known and what is new on the studied issue? What necessitated the research problem, described in the manuscript? What is your hypothesis and aim? Material and Methods. The objects of research, organization of experiments, chemical analyses, statistical and other methods and conditions applied for the experiments should be described in detail. Results and Discussion. Results of research can be presented separately from discussion or together in one paragraph. Presentation of results should be precise and without repetitions, and include the evaluation of significant differences and other parameters. Conclusions. Present the most important consequences for the science and practice resulting from the conducted research. They should be summarized in few sentences. Illustrations. Illustrations (maps, charts, graphs, drawings, photos, etc.) are to be referred to as ‘Figures’ and numbered in sequence. They should be as clear and free from text, presented as in format tif, png, xls, eps. Numeration and title of the figures are placed below the figure, with all necessary indications presented. It is recommended the figures to be in black and white. Provide figures and photographs with good dark and light contrast. Tables and other illustrations should be submitted on separate sheets, and must be cited in the text. The position of each table, graph, figure, etc. in the text must be indicated. Photographs/pictures should be made with high contrast. Each illustration should be accompanied by a caption. Put the captions on a separate list at the end of the manuscript. Explanations should be typewritten under the illustration and given in this list, too. In the text, references should be cited as follows: single author (Morris, 1991); two authors (Barton & Moore, 1994); more than two authors (Levi et al., 1994). 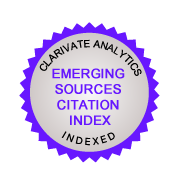 When several references are cited simultaneously, they should be ranked by chronological order e.g. : (Petrovic et al., 2011; 2015) and when their publications are in the same year – alphabetically. All published works referred to in the text must be listed in the reference list and vice versa. Reference list is arranged alphabetically (by the surname of the first author) and chronologically. When citing several publications by the same author, his individual publications are given first, followed by publications in co-authorship (with one co-author, two co-authors, etc.). It is desirable to list the names of all authors. Names of authors and journal titles in Cyrillic or alphabet different from Latin should be transliterated into Latin and article titles should be translated into English. The original language of articles and books translated into English is indicated in brackets after the bibliographic reference (in Bulgarian = Bg, in Russian = Ru, in Serbian = Sr, in Chinese – Ch, etc.). Example: Stoyanova, N., Antonova, V. & Serbezova, D. (2015). A study of introduced black currant varieties. Rastenievadni nauki, 52(2), 25-28 (Bg). In transliteration, letters are replaced as follow: А=A, Б=В, В=V, Г=G, Д=D, Е=Е, Ж=Zh, 3=Z, И=I, Й=Y, K=К, Л=L, М=М, Н=N, О=О, П=Р, Р=R, С=S, Т=Т, У=U, Ф=F, X=H, Ц=Тs, Ч=Сh, Ш=Sh, Щ=Sht, Ъ=А, Ь=Y, Ю=Yu, Я=Ya. Popova, V., Drachev, D. & Nikolova, V. (2006). Investigation on the burning properties of Burley tobacco grown in different regions of Bulgaria. Tobacco, 56(7-8), 159-164. Solomon, P. S. & Oliver, R. P. (2001). The nitrogen content of the tomato leaf apoplast increases during infection by Cladosporium fulvum. Planta, 213(2), 241-249. McGrath, S. P. (1998). Phytoextraction for soil remediation. In: Plants that hyperaccumulate heavy metals. CAB Int., Wallingford, UK, 261-287. Georgiev, D., Dinkova, H. & Georgieva, M. (2008). Study of newly introduced cultivars of black and red currant. In: Sustainable Fruit Growing: From Plant to Product, Proceedings of International Scientific Conference, Latvia, 46-53. Baychev, V. (1994). Hybrids between (Triticum aestivum L. x Secale cereale L.) and Triticale (2n=6х=42). In: 3rd International Triticale Symposium, 13-17 June 1994, Lisbon, Portugal (Abstracts), B-12. Petrova, V. (2015). Economically important pests of apple and fight with them at various technologies of cultivation. Dissertation, Kyustendil, Bulgaria. After the reception of the article, the manuscript is given to referees for anonymous peer review. Authors will be notified about the acceptance or rejection of the manuscripts. The corrected manuscript should be submitted to the website of the journal. The Editorial Staff is not responsible for inaccurate citations, including the content of websites and copyright infringement.